Below is a cross section of a leaf, this is what you would see if you looked down the leaf towards the stem. 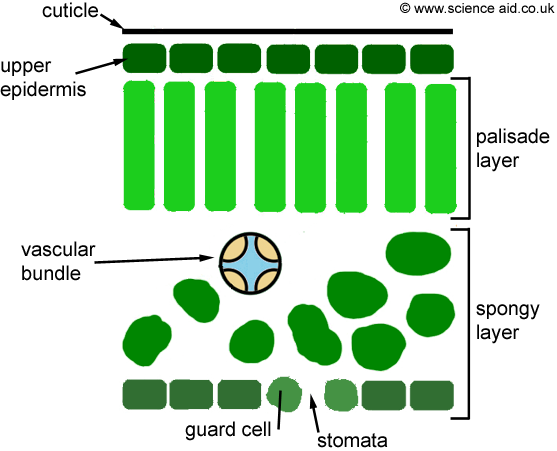 The guard cells control the entry of carbon dioxide through the stomata by opening and closing. Therefore they close at night - reducing water loss. The long, thin shape of the leaf provides maximum surface area for receiving light. The waxy cuticle on the top of the leaf protects it from the elements and also prevents water from escaping. ... cells have alot of chloroplasts (containing chlorophyll) in them - making the most of the conditions high in light on the top of the leaf. Phloem carry sugar and amino acids, and xylem carry water and mineral ions from the roots. Transpiration is the movement of water molecules through the plant. Up from the roots, through Xylem vessels and evaporationg out through the stomata in the leaves. Certain conditions affect the rate of transpiration. If it is warm, water is lost because of the increased movement of the molecules. The wind will blow away molecules near the stomata. Humidity will slow down water loss because the concentration gradient is small.